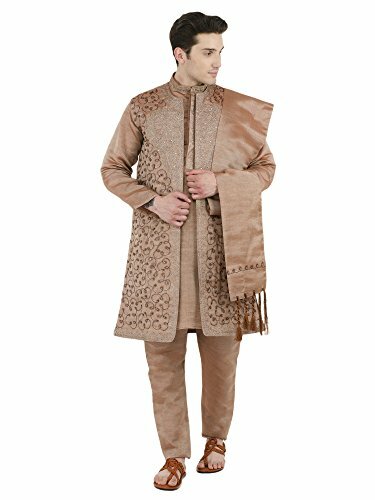 4-piece Sherwani Kurta Pajama Stole set in art silk (polyester) fabric, ethnic men's wear from India. Using art silk (polyester), our 4-piece tunic set brings together quality and style. A completely traditional Indian design, this 4-piece set is handmade from the absolute finestof art silk (polyester) and feels you to stylish luxury with each and every wear. Like traditional kurta pajama set worn in India, this 4-piece set includes a top, bottom, sherwani or overcoat along with stole. There is beautiful embroidery around the collar and placket and full embroidery on overcoat or sherwani. Loose fitting sleeves and slits along the sides allow for an easy fit and let air circulate freely through the garment. The pant included in this kurta pajama set has a relaxed fit through the seat and legs for absolute comfort and made of art silk (polyester) fabric. Loose comfortable fitting makes it a great wear. This 4-piece set is worn in both summer and winter. Comes with complimentary free size trouser (pajama) with drawstring in waist. 4-piece sets like this is traditionally worn in India for everyday wear as well as for festivals and special occasions, but in the West, they can be worn in a number of ways. The ways that you can wear this luxurious 4-piece set are endless; you can mix and match the pieces with other things in your wardrobe. BEAUTIFUL HANDLOOM KURTA PAJAMA SET : This is a 4-pieces set that includes sherwani or overcoat, kurta, pajama and stole. Traditional design on this kurta pajama set captures all of the details of the classic Indian men's garment with long sleeves, a long hemline with side vents and a mandarin collar. COMFORTABLE FIT: Sizing is designed for a regular relaxed fit. Available size chest S(38 Inch), M(40 Inch), L(42 Inch), XL(44 Inch). Please see the size chart. We recommend ordering a size larger for a loose fit. Everyone looks good in this traditional kurta pajama set for men. HIGH QUALITY MATERIAL: Lightweight and breathable material gives this kurta pajama set soft, comfortable feel. Made from the finest handloom art silk (polyester) fabric. Finest embroidery textured work on all over the sherwani or overcoat. Designs feature modern and innovative details that appeal to everyone.